What happens when a superhero becomes the world’s greatest villain? 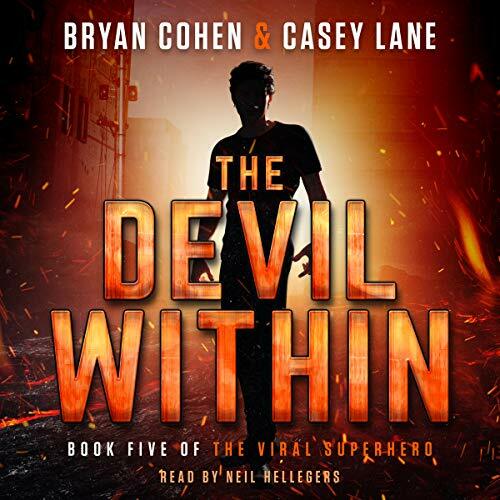 The Devil Within is the fifth book in The Viral Superhero Series, a saga of high-octane, super-powered adventure novels. If you like incredible abilities, bloodthirsty villains, and superhero support teams stepping into battle, then you’ll love Bryan Cohen & Casey Lane’s latest high-school thrill-ride. Buy The Devil Within to continue the super-heroic journey today! The book starts a couple months after the events of the last novel. Ted and the general have switch places and people are starting to notice the changes on both sides. The general has wiped teds memory and The general has got big plans for earth.